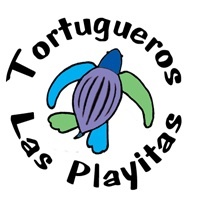 These cozy one bedroom/one bath casitas, nestled in palm trees are walking distance to markets, downtown and Playa La Poza for turtle hatchling releases. Each Casita is furnished with Queen size bed, high quality linens, palapa covered kitchen, wireless internet connection, tv/vcr with movie library, cd player and located inside a gated property. 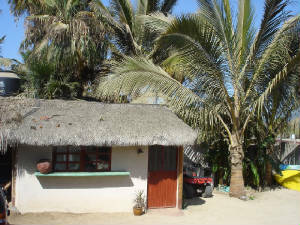 The Casitas can be rented seperately or together for a discounted rate. 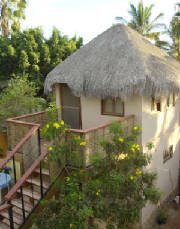 Casita #2 is slightly larger, the bathroom is attached to the bedroom, and can accommodate up to three. 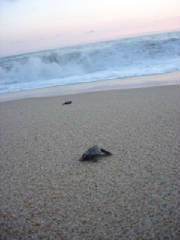 Casita #2 is offered at $65/nightly.